This photo of a previously unknown species of hummingbird led to the discovery of the critically endangered Blue-throated Hillstar. High in the Ecuadorian Andes, a stunningly beautiful species of hummingbird—decorated with a flashy, sapphire throat—has revealed itself to science for the first time. But scientists fear it’s already perilously close to extinction. The páramo is a tundra-like habitat found in the high Andes; a cold, windswept zone above the treeline but below the permanent snow line that’s covered in grass and low, flowering shrubs. It was in this dramatic, foggy, alpine landscape that Sornoza-Molina happened upon a young, unidentifiable hummingbird, and snapped a photo. Days later, in the same area, he found and photographed a second unplaceable hummingbird, this time a mature male with iridescent blue feathers on its throat. Sornoza-Molina reached out to fellow bird researchers, and it soon became clear that this was something new. 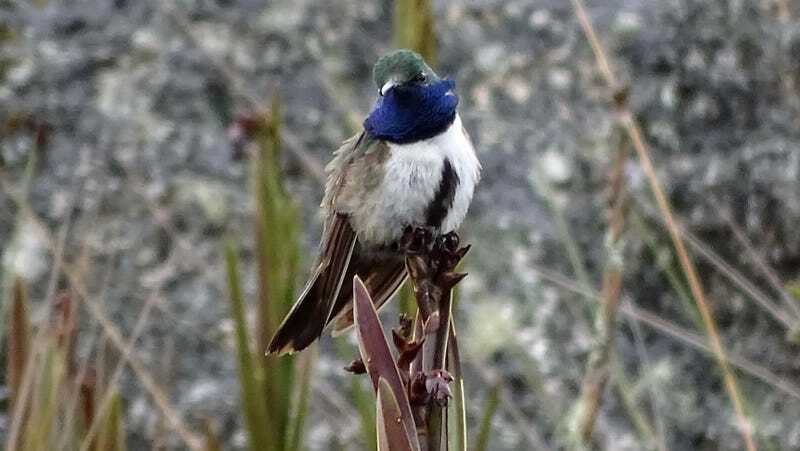 It was certainly a hillstar—a group of territorial hummingbirds that bizarrely prefer hanging out in chilly, high-altitude Andean grasslands—but none were known to have a dazzling blue throat. Interest piqued, the team of researchers began an investigation into the bird’s true identity. Some members of the research team went back to field where the first birds were photographed—Cerro de Arcos—and collected a few of them to bring back into the lab. To figure out just how unique they were, the team compared the birds to other hillstars thought to be closely-related. Small differences in genetics, appearance, and calls suggests that the hummingbird is a species new to science, according to a research paper published Wednesday in The Auk: Ornithological Advances. The bird is closely related to the green-headed hillstar (Oreotrochilus stolzmanni), which has a green throat patch or “gorget”. The team has named the new species the blue-throated hillstar (Oreotrochilus cyanolaemus)—and that deep blue gorget makes a huge difference. “If a female of one species would see a male of the other species or vice-versa, it would not recognize it as part of the same species and, thus, they would not reproduce,” Elisa Bonaccorso, a study co-author and researcher at Instituto BIOSFERA, Universidad San Francisco de Quito, told Earther. The two species are also physically separated from each other by large tracts of unusable habitat. The discovery is incredible and unexpected, especially when you consider that the last new bird species from Ecuador was described in 1999, said Juan Freile, another study co-author and researcher at Instituto BIOSFERA. But the blue-throated hillstar may have a rocky road ahead. “Its global distribution seems to be extremely small; one of the smallest among the hummingbirds,” Freile told Earther, noting that the entirety of the area it inhabits is about 100 square kilometers, roughly the size of The Bronx. There, it is only found flitting along bush-lined creeks. Based on their observations, the researchers think there may be a maximum of 750 blue-throated hillstars in existence, perhaps less than 500. The bird’s extreme vulnerability is made even worse by mounting threats to its habitat, so much so that the researchers consider the new hillstar to be critically-endangered. The area has essentially zero protection from the cattle ranching, burning, agriculture, and gold mining that threaten the páramo. “The urgent action would be to declare a conservation area where all these activities are prohibited,” Bonaccorso said. Freile notes that there’s a small local initiative for ecotourism, and that provincial authorities— already aware of the hillstar’s discovery—are excited about potentially implementing a network of protected areas that include Cerro de Arcos. “Birders will be eager to see this new hummingbird, and this might represent a potentially important income source for the local community,” Freile said. Whatever the fate of the blue-throated hillstar, for Bonaccorso, a lesson here is the vulnerability of poorly-cataloged life in southwestern Ecuador’s highlands. The finding illustrates that there’s plenty left to discover and protect even in smaller countries like Ecuador that have had their native bird species relatively well-investigated, says Freile. There’s a sense among some ornithologists that only the vast unexplored territories of big countries like Brazil, Peru, and Indonesia have anything left to find, he added.